This scene is almost like a moment captured in time as the villager in the canoe sails past. This tapestry "The Bridge" shows us a European scene with a bridge across a river and a landscape which suggest a change in season as the leaves are falling from their branches and golden hues start enveloping the grasses. This location is typical of a village in countryside Belgium where the bridges and buildings complement the beauty of nature which surrounds the villager's lives. This magical tapestry captures this space and time very well. 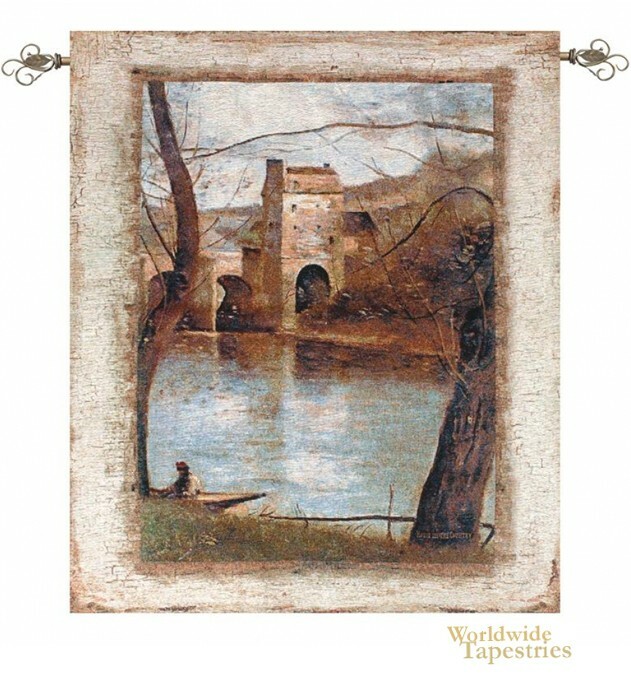 This tapestry "The Bridge" is backed with lining and tunnel for easy hanging. Note: tapestry rod and tassels, where pictured, are purchased separately.